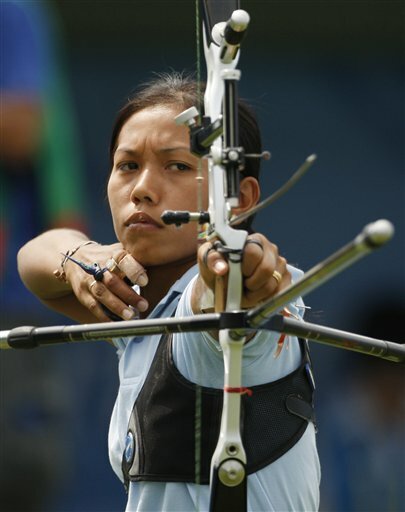 Laishram Bombayla Devi is an Indian archer who represented India at the 2008 Beijing Olympics in the women's individual as well as team events, but failed to reach the finals in both events. She was ranked sixth in the team event qualifiers. In the individual event, she was ranked 22nd in the qualifiers, but lost to Iwona Marcinkiewicz of Poland by 101–103 in the round of 64. She was sent out in the pre-quarterfinals of the women’s individual recurve event losing 2-6 to Mexico’s Roman Aida at the London Olympics 2012. She, along with Dola Banerjee and Pranitha Vardhineni were ranked sixth in the team event qualifiers. They got a bye in the round of 16, but lost to China by 206–211 in the quarterfinals. In the individual event, she was ranked 22nd in the qualifiers, but lost to Iwona Marcinkiewicz of Poland by 101–103 in the round of 64. The biggest obstacles faced by archers: How much of a role does wind play?